That was the basic idea behind Project Tugbird. It’s possible that in 1958, the crew aboard the U.S. Coast Guard buoy tender Juniper were crouching, fearing the thin steel cable pulling them through the water at 15 mph might break, snap back, and, like a scythe, cut them in half. Yet it’s likely they were also gawking at what was providing their forward propulsion. On the other end of the cable, 300 feet ahead and 30 feet up, was a bright yellow Coast Guard helicopter, the bird in Project Tugbird. 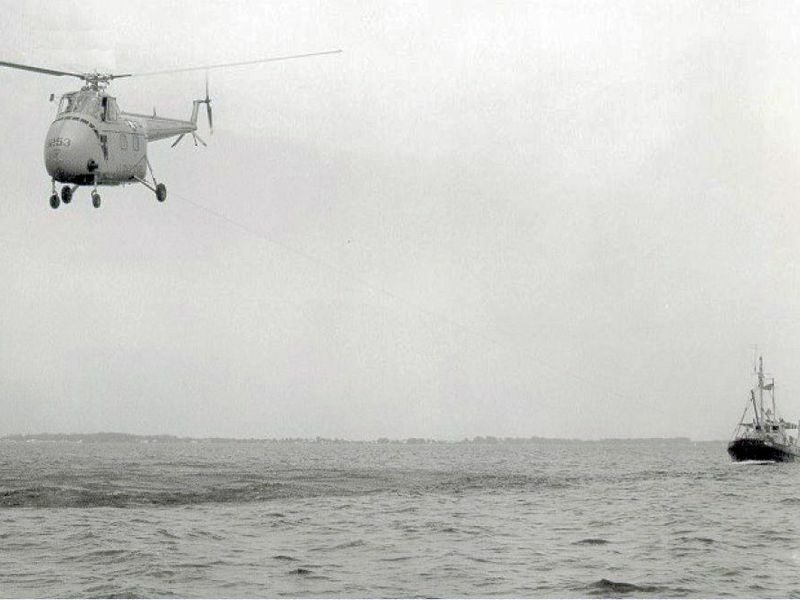 In November 1951, the Coast Guard began receiving the new Sikorsky HO4S helicopter. Equipped with a winch, a rescue basket, and a roomy passenger compartment, it was ideal for search and rescue. 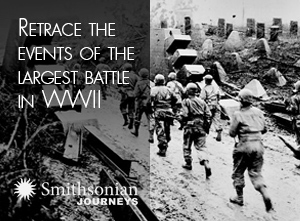 By early 1958, 30 were stationed at U.S. coastal cities. Along the way, someone thought it might be a good idea to use the helicopter for towing vessels—fishing, pleasure, and other types—out of harm’s way. Coasties identify the inventor of the Tugbird as Commander Al Flanagan, an engineering and maintenance officer at the St. Petersburg station in Florida. In August 1957, Flanagan began testing the feasibility of using the HO4S as a tow vehicle. A quarter-inch steel cable with a tensile strength of 6,900 pounds was attached to the lower rear fuselage of the HO4S; Flanagan then towed aircraft tractors, a 4 x 4 personnel carrier, and even a bus along the runways. He then moved up to ships, culminating with the 794-ton Juniper. Headquarters directed that each Coast Guard air station have at least one HO4S equipped for Tugbird duty. When Flanagan was transferred, the project proceeded under Lieutenant Commander James Iversen. “The main element of training was in towing vehicles up and down the runways,” recalls Iversen. “I towed the buoy tender Blackhaw and the 165-foot cutter Nemesis around Tampa Bay for demonstration.” The crewmen/hoist operators were schooled in lowering the tow cable to the ship through an opening in the fuselage floor. Tugbird was first used in an official search-and-rescue operation in September 1958, when a St. Petersburg-based HO4S towed the distressed pleasure cruiser Nina-Jean to safety. One standout rescue occurred in January 1964, when the engine of the fishing vessel Pirate II quit near the entrance to San Francisco Bay. The wind rapidly pushed the ship toward Seal Rocks. Its skipper placed a distress call at 3:19 p.m., and a Tugbird HO4S launched from San Francisco International Airport. Some 20 minutes later, with Pirate II just 50 yards from being dashed to pieces, the towing began. The waves were 15 feet and winds were gusting to 32 mph; the gauge showed towline tension surging to 3,100 pounds—100 pounds over the recommended maximum. But soon Pirate II was pulled free from danger. Airline captain Craig Thorson enjoys researching the early use of military helicopters, especially the Sikorsky S-55, which served with the U.S. Army and the U.S. Air Force.